It’s Girl Scouts cookie contest time!! I’m cooking with cookies! I feel I have crossed a MAJOR milestone in my life. I had a box of Girl Scouts Samoas in my cupboard for a week and managed not to consume the entire thing. 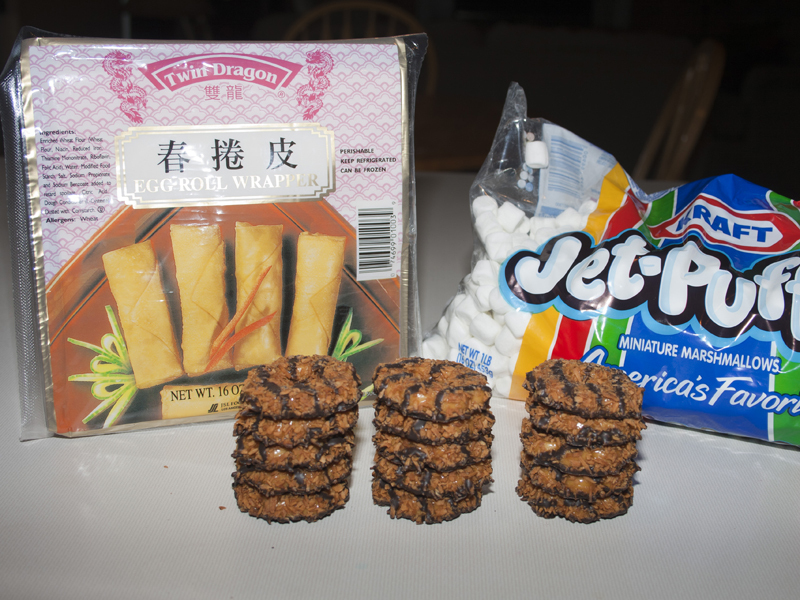 In my opinion, Samoas are the perfect food. Shortbready cookie, caramel, coconut and chocolate. Oh glory. I know I’m not alone. Samoas make up about 20% of the total cookie sales by those sweet little sugar hocking scouts. These babies are second only to Thin Mints, which I contemplated using for this contest, but knew I could only stretch my willpower so far. 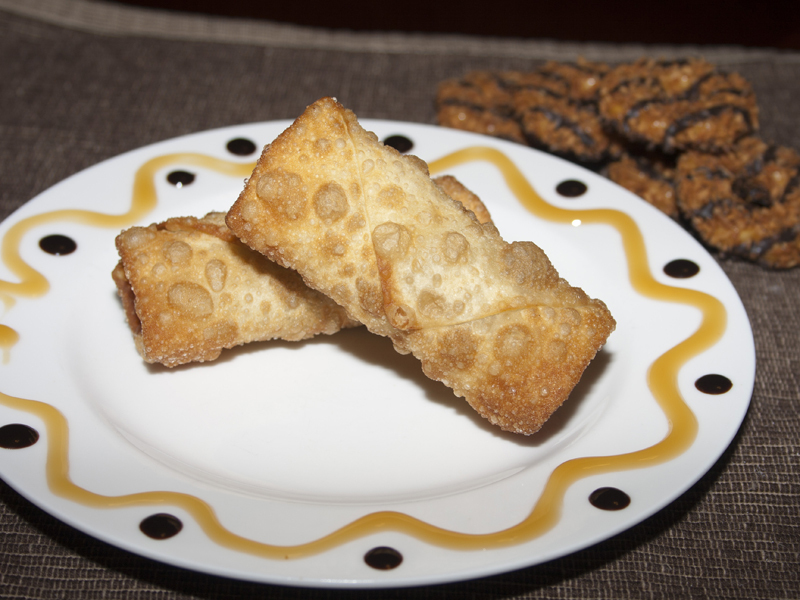 My task for this contest was to create something incredible using Girl Scout cookies. And The Girl Scouts of Western Washington GAVE me 5 boxes to play with. My life is so grand! My very first thought was that Samoas could only be made more perfect by one thing. Marshmallow. With that plan in mind, this is what I came up with. 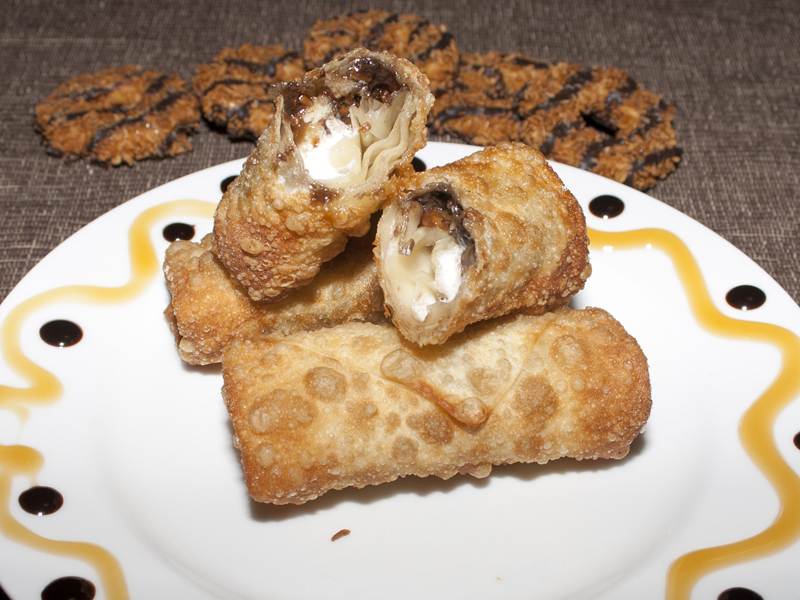 Samoas S’more Rolls. These three ingredient rolls are absolute heaven and the most time-consuming part is waiting for the oil to heat up. It’s a simple chop, fill, roll and fry. But the result is just amazing. I consumed the first two rolls fresh out of the fryer, burning my fingers getting the molten chocolate and caramel into my mouth. Where, I also toasted my tongue just a little. The smell was overpowering – I could not resist long enough to allow them to cool. The filling was divine. Melty mallow goodness wrapping around sweet caramel and rich chocolate with a hint of buttery coconut. All of that gorgeous deliciousness wrapped in a crispy roll. Oh gracious these are good. I cooked up a few more batches, fed some to my kids and then ran the rest over to my neighbors because once there was caramel and chocolate dipping sauce on the plate, these were not long for the world at my house. Little envelopes of perfection. Mmmmmm. Girl Scout Cookies go on sale to the public March 1-17! There is an awesome cookie locator, as well as an app, that tells you exactly where girls are selling cookies in your neighborhood! Head over to the Girl Scouts of WW facebook page and give them some love! As soon as cookies go on sale, get yourself a box of Samoas and whip up some of these rolls. Your taste buds will sing thanks to me but the rest of you may hate me for giving you the idea! You can vote for the finalists from February 19 – March 1 by clicking HERE. 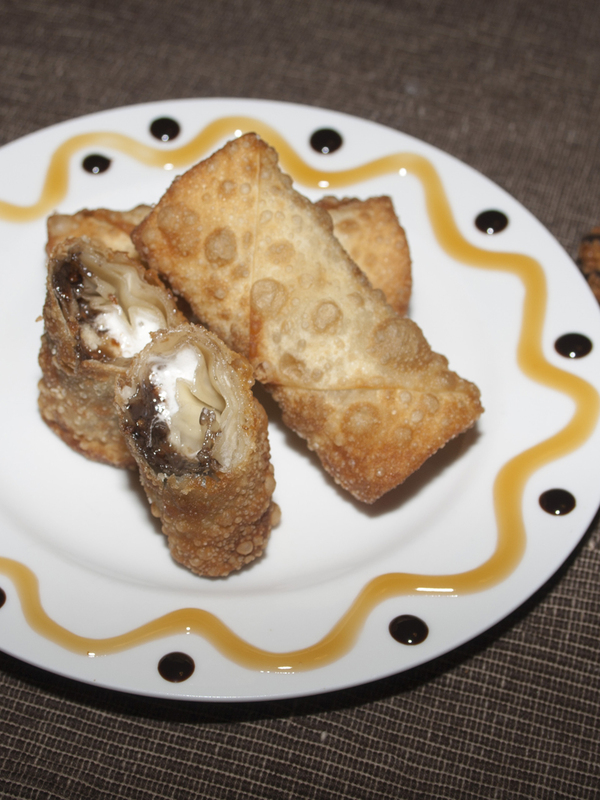 I hope you’ll see these Samoas S’more Rolls on the list! 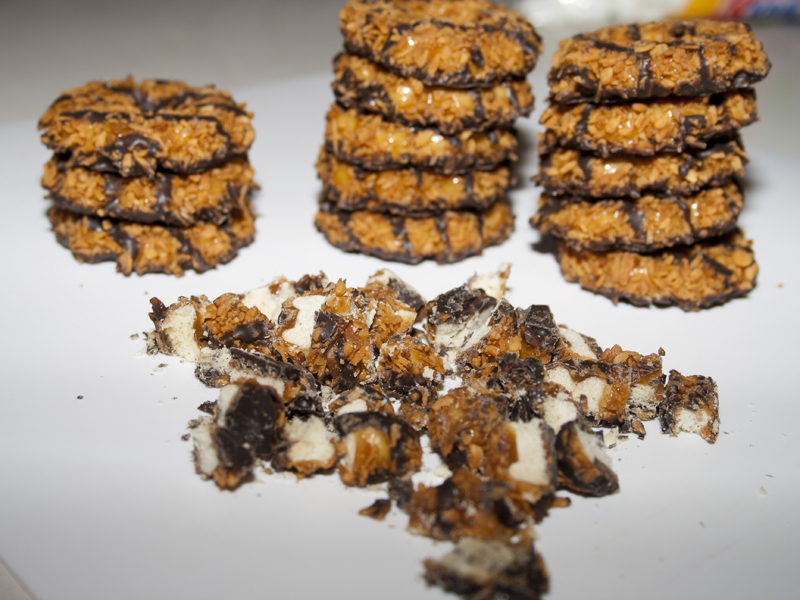 Cut Samoas into 1/4-inch chunks. Take an egg roll wrapper, and brush edges with a little water, and lay on a work surface, water side up, with a point facing you, not a straight edge. Place about 1 chopped cookie 1 or 2 inches from the edge, and top with 4 mini marshmallows. Fold the corner closest you up and just over the filling, press lightly, then fold in the sides, making a little pull or tuck to keep the roll right. Then roll away from you and press to seal tightly. (Take care not to tear the egg roll wrapper. This can cause roll to leak while cooking. If tear occurs, pinch dough together until it reseals or discard wrap and use a new one.) Repeat until all egg rolls are formed. Fry egg rolls 2 at a time, turning almost immediately, cooking on all sides to just golden brown, about 1-2 minutes. (Make sure not to overcook filling. If you see marshmallows start to ooze out before both sides are golden, filling will be overcooked and egg roll will appear hollow inside) Remove to a paper towel-lined plate and repeat until all cooked. Make sure to check your oil temperature between additions.